The Punjab Government is going to issue Artist Khidmat card under the project of Artists Social Support System (ASSS) in the province for artists who need socioeconomic support to survive.Its tremendous initiative being taken by Punjab Govt in order to give worthy reverence to Artists pertaining to any field as well. Artists Social Support System (ASSS) is a set up launched by Punjab government with an aim to the provision of financial grants and social protection to artists in unfavorable circumstances Its an important Milestone towards the welfare of Artist Community living in tehsils and districts across the Punjab. This initiative will ultimately become cause of leading respectful life for artists and also promoting art and culture accordingly. The Punjab Council of the Arts is an autonomous body established under the Punjab Council of the Arts Act of 1975. It advises the Government on all matters of policy relating to art and culture activity through its Divisional Arts Councils. This Programme is designed upon the keen interest of Punjab Council of the Arts. This program shall also be facilitated in synchronizing the whole process by Lahore Art Council. There are various areas from which an artist could be eligible to apply for the financial assistance as follow. He/She must have age not less than 50 years. Experience in relevant field must be 25 years as well. Monthly Stipend/Financial assistance shall be provided to those deserving and eligible Artists for their socioeconomic welfare through ATM in transparent and systematic manner. 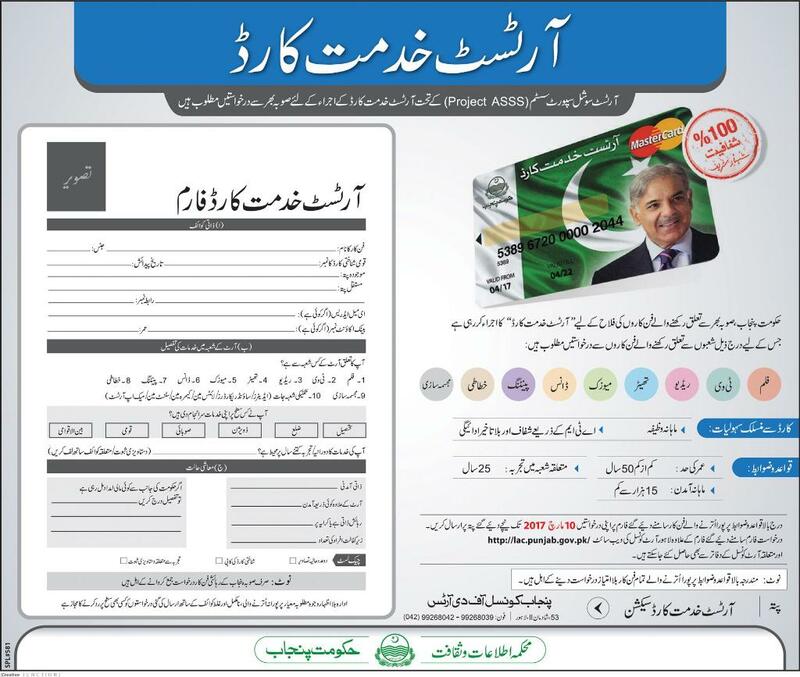 Meeting the all above prescribed conditions applicant can download application form http://lac.punjab.gov.pk/ or can visit concerned Art Council office accordingly. Application form must cover all aspects as incomplete application shall not be entertained. Last date to apply for registration is 10th March,2017. Complete application must be send on “Artist Khidmat Card Section” Punjab Council of the Arts 53, Shadman II Lahore. Phone # 042-99268042.